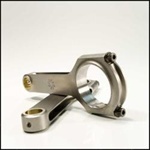 BoostLine Connecting Rods by Wiseco are designed to stand up to boost and nitrous. The patent pending design is stronger and has 60% more bending strength than the common H-beam! Each rod includes 100% CMM inspected and included a signed quality report in the box. �ALL VW / Audi VR6 Engines & 10V VR5 Aluminum Rods are CNC machined out of their proprietary aluminum alloys developed exclusively for R&R. The Pro-series alloy has up to 24% increased tensile and yield strength over competitors rod alloys. All alloys are cold extruded under 2,000+ tons of pressure to ensure consistent grain flow and density. This yields the strongest and lightest rod possible with an exceptional fatigue life and reduced elongation. As with all our connecting rods, material has been ultrasonically tested, bores are precision honed to standards, mating surfaces are standard or circle-loc� serrated for super-strength and perfect cap to rod alignment, and all corners are blended to eliminate stress risers. 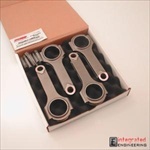 All connecting rods come standard with L19 ARP bolts. You may need to notch the block for fitment. These may take 2-4 weeks to ship.